On Wednesday night, the mighty Amsterdam ArenA played host to an exhilarating matchup between two of European football’s most exciting teams; AFC Ajax and Olympique Lyonnais. “De Goedenzonen” couldn’t be a more fitting description of Peter Bosz’ current Ajax squad, whose average age heading into the Europa League Semi-Final was a tender 21.9 years old. Featuring the likes of Justin Kluivert and Mathijs de Ligt, Ajax have stayed true to their age-old philosophy of youth development and are sowing the seeds of success as they fight for their first Europa League title since 1992. Currently four points off the top of the Eridivisie behind Feyenoord, Ajax find themselves in the midst of a twenty-one-game unbeaten streak, with the last ten of those games ending in victory for the Amsterdammers. Their Europa League form is just as impressive, having lost just two of their thirteen games so far and amassing four clean sheets in their last four home games.After a scare in the last round against Schalke, Ajax suffered a defeat at the hands of PSV in the Eridivisie, all but ending their title hopes this season. Ergo, the Europa League may be their only chance of silverware this season. A ten-day rest gave the hosts plenty of time to prepare after Viergever’s second yellow during his man-of-the-match performance against Schalke, and Veltman’s red card in the same fixture meant that Ajax were weakened in both Full Back positions. Tete and Riedewald deputised with ease, the former proving to be efficient in both defence and attack with his ability to recover and regain his balance after a mistake or lost challenge. Youngsters de Ligt and Sánchez remained composed at the back while under pressure from Lyon’s forwards. Both looked to get forward where possible and add yet another component to Ajax’s dynamic attack. Lasse Schöne and Davy Klaassen sat comfortably in front of the back four, with the movement from the forwards ahead of them and quick tempo allowing them to dictate the flow of the game. Hakim Ziyech lined up on the left of the midfield three, though he was given free roam of the pitch in an attempt to break apart Lyon’s high midfield line. Traoré and Younes were excellent on the wings and provided both width and ball security in tight spaces, without the pair, Ajax would have struggled to create anything in the final third. Kasper Dolberg once again lead a flexible 4-3-3 and continuously caused problems for Lyon’s Centre Backs, finding spaces between the two and showcasing his unique ability to anticipate the flow of the game. For fans and critics alike, Lyon were strong favourites to reach the final with their unstoppable attack and lightning pace. Relying on their excellent home form to carry them through the latter stages of the competition, OL saw off Besiktas in a nail-biting penalty shootout in the last round to reach the Semi-Final. With Lacazette doubtful for the first leg, the Frenchmen needed to keep it tight at the back and to get an all-important away goal which would allow them to control the second leg at the feared Parc Olympique Lyonnais. Sat in fourth place in Ligue 1, a whopping twenty points behind third-placed Nice, a Europa League title would guarantee Lyon a place in the Champions League next season. Lyon lined up in a rigid 4-2-1-2-1 yet with Depay ineligible for the tie, and Lacazette benched due to injury, they lacked options in their attacking phase. The capable yet inconsistent Nabil Fekir led an attack consisting of key man Valbuena and Cornet on the opposite wing. Tolisso – something of a talisman for the French side – made his return to the starting line-up after a period on the sidelines with an injury and orchestrated the offence from the centre of the field. Veteran Maxime Gonalons added some much-needed stability to the centre of the field alongside Lucas Tousart. Jallet and Morel provided width when possible, though the latter often found himself pinned inside his own half by the superb Bertrand Traoré. Diakhaby and N’Koulou occupied the centre of a disjointed and lethargic back line and seemed to struggle with the tempo of Ajax’s attacks. Once the game began to settle, with Schöne dropping in between the two Centre Backs, Ajax’s meticulous attention to detail in their build-up play shone through. There were many different phases to Ajax’s play, and they often relied on the individual skill of Traoré, Younes and Ziyech in wide areas. Predominantly, however, they shifted the ball between each vertical zone (Wing-Half Space-Centre-Half Space-Wing) with short, precise passes. By focusing the majority of their play between each half-space, Ajax could exploit the space around Lyon’s two central midfielders and outnumber them in the centre. Simply put, if the ball is in the centre of the field, both midfielders are likely to pressure the ball carrier. Place the ball in either half space, however, and only one Central Midfielder is able to commit. Without a wide player alongside him, this creates a one-on-one matchup in the half space and centre but leaves the opposite half-space free. It’s worth noting, the way to defend this would simply be to instruct your winger to sit narrower in defence. Lyon, with their high pres, were unable to do that effectively. For example, with Ziyech allowed to roam free into the half space ahead of Klaassen and Schöne, and the winger from the opposing side cutting into the unoccupied half space, it creates a passing square in which the ball carrier always has an option to pass to, vertical, horizontal or diagonal. If the Full Backs were free to push forward, either winger could replace Ziyech in the half space, who could then drift into the centre. Ajax found themselves in this scenario time and time again throughout the game – albeit with different personnel – by simply passing the ball horizontally across the field and waiting for holes to open up between Gonalons and Tousart. Following that vertical pass, Ajax then had the option to push wide or cut back into the central area. More often than not, the Dutch side opted to cut back inside to an onrushing player. During the latter stages of the game this became much more prevalent, with Lyon seeming to abandon all hope on defence in an attempt to get a second away goal. Early on, however, Lyon managed to keep themselves fairly compact at the back, leaving little room in the centre for Ajax to work through. They opposed this compactness by laying the ball off with a short backwards pass and then launching a diagonal forward ball into the path of Traoré and Younes. These balls nullified Lyon’s attacking threat for a large portion of the game, simply because their Full Backs were unable to push forward. As the game progressed, Ajax’s build-up grew in speed and efficiency. Lyon switched to a vertically compact midfield, who sat within ten yards of the defence. Though this again shunted any opportunities developing through the centre for Ajax, it allowed them to shift the ball across the field in passing moves which resembled what we would see on a Rugby field – across the length of the pitch, slowly gaining ground with each pass until a gap opens in the defence, and a player charges through. Lyon settled into Wednesday’s game quickly and used the ball well in the first twenty minutes of the game. Particularly down the right wing, with Jallet’s attacking proficiency, Lyon found themselves behind Ajax’s inexperienced back line on more than one occasion. Tolisso and Cornet were given license to swap positions as the move progressed, putting the former in prime position to play a killer pass through the defence towards the byline and into the path of Cornet on the inside, or Jallet on the outside. Although they found themselves in goalscoring positions, Lyon were wasteful with the ball inside Ajax’s area. Driven cross after driven cross from the byline in the early stages of the game went unanswered and OL failed to pick up the second ball in a dangerous area, with their priority being defensive structure in transition, as opposed to press the ball. This was in part due to Ajax’s outstanding defensive positioning, though Lyon’s only goal came from a poorly cleared driven cross. Lyon looked at their best when they managed to stretch Ajax and force the one-on-one matchups, particularly with Fekir and Valbuena. In the build-up to the goal, Lyon pushed the ball wide quickly and exploited an outnumbered Tete, who was unlucky not to block the initial cross. A poor clearance saw the ball land at Valbuena’s feet on the edge of the area and time froze as the Frenchman picked his spot. Minutes later, Lyon attempted the same thing on the opposite side of the field, this time finding Fekir one-on-one against youngster de Ligt. With Sánchez’ tendency to attack the ball, Lyon had the opportunity to exploit the one-on-one matchup behind him but failed to do so with no one running beyond Fekir in a central area. Arguably Lyon’s best chance came from this scenario with Tolisso in the centre and Fekir able to run in behind. Sánchez committed to an unfavourable challenge, leaving de Ligt alone in the centre and in a poor position to defend against Fekir to his right. The ball was played through the gap and Onana was forced to make a brilliant save to keep Lyon at bay. Following their first goal, Ajax pressed Lyon relentlessly. Often in twos or even threes, they made sure they surrounded the ball carrier and strangled him out of possession. That way, when they won the ball back, they had an immediate outlet who could then carry the ball forward and look to start an attack. 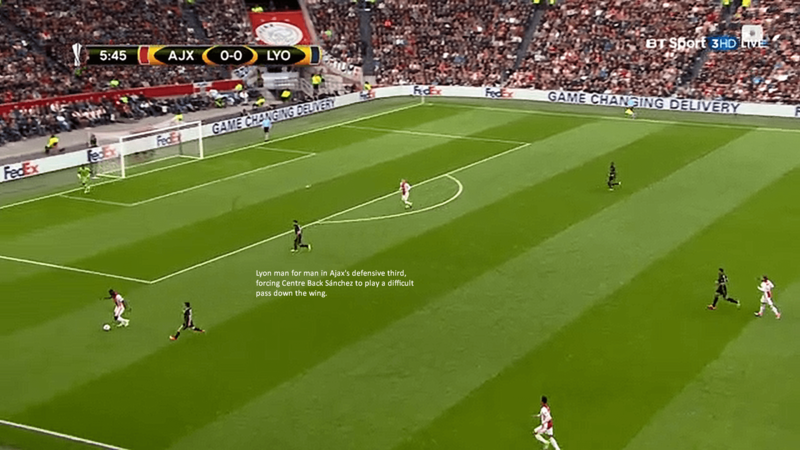 Ajax allowed Lyon to have the ball between their Centre Backs and Goalkeeper, and opted to press the second line of players; Full Backs and Central Midfielders. This meant that they remained compact behind the ball and could defend as a unit, as opposed to Lyon’s style of pressing Ajax’s first line of defence. This gave Dolberg, Traoré and Younes the chance to press from the blindside, which is an often-underestimated technique of pressing where your opponent simply does not know you are coming. Particularly if, like Lyon, they are not communicating effectively. The main difference between the two pressing styles was their “orientation” or “focus”. Of course, the football is arguably the most important factor of a football game; without it, you cannot score therefore you cannot win. But, how you defend against the ball can differ as, without it, you are simply stopping your opponents from reaching your goal. Ajax opted for a zone-oriented defensive scheme, in which they allowed Lyon to keep the ball in areas they deemed not to be dangerous, then pressed intensely in dangerous zones. This scheme is what gave them so much success in their pressing game; they lured Lyon into traps they had set between zones and surrounded them with bodies. Lyon, on the other hand, preferred a ball-oriented pressing scheme. Their main focus was to win the ball back high up the pitch and attack Ajax while they were outnumbered and weak. While a risky tactic, particularly away from home, this scheme can tear a team apart if utilised correctly. A key part is the ability to press as a unit, Lyon failed to do so. Following the suspensions to both Viergever and Veltman, Ajax went into Wednesday’s game lacking any real experience in their back line. Despite the magnitude of the game, Bosz stuck to his guns and played two of Ajax’s most promising talents at Centre Back; Mathijs de Ligt and Davinson Sánchez. After watching them against Lyon and the past few Europa League games, you’d be forgiven for thinking they were seasoned veterans. Bosz’ zone-oriented system carried through to his defensive line, who were tasked with keeping the terrierlike Nabil Fekir at bay. The key to this defensive partnership was Sánchez’ aggressiveness when tackling in the open field. For the Football Manager fans among you, Sánchez played the role of a “stopper”. His anticipation and unique tackling ability saw him take residence just ahead of de Ligt, in prime position to snuff out any Lyon attacks through the centre. Time and time again we saw Sánchez dive in for a risky challenge in the centre of the field, with the knowledge that he would be supported by both Ajax’s press ahead of him, and the cautious position taken up by de Ligt behind him. De Ligt, on the other hand, remained the more cautious of the pair. The 17-year-old balanced the partnership by playing in a kind of sweeper role when Sánchez committed forward. Because Lyon only played with one central striker, this allowed de Ligt to keep the game ahead of him and focus on the forward runs of Tolisso, Cornet at Valbuena into the half space. Such a risky system was not without fault, however. As the game opened up in the last twenty minutes, Sánchez slowed down and struggled to maintain the intensity he had during the first half. As I stated before, a quick change of positions for Lyon meant that Ajax had to momentarily deal with two strikers. Sánchez lost the 50-50 ahead of his defensive line and de Ligt failed to react to Fekir’s movement, resulting in a clear opportunity for the Frenchman. Both players excelled on the offensive, too. After the initial Lyon onslaught, both players pushed wider in possession as Schöne took up a deeper position in the centre. In an attempt to break down Lyon’s press, de Ligt often carried the ball out of defence toward the left wing; one quick look at his heatmap shows how attacking he was with the ball at his feet. Diakhaby and N’Koulou’s performances summed up Lyon on the night. They started well, but lost their nerve after Ajax began to press following their first goal. The pair struggled in possession and offered little on the offensive side of the ball, and even less on the defensive side. Both players looked dejected at the end of the first half, their body language was poor and it affected their game massively. For Ajax’s second goal, N’Koulou is flat-footed and out of position to deal with Traoré’s header. Fifteen yards away, Dolberg can’t quite believe he’s got so much space to run into between the two Centre Backs. Ajax’s third goal came from a similar position on the opposite side of the field. They won the ball back with a high press, and Diakhaby found himself wrong-footed in the centre of the field. With Jallet pushed up the wing, Younes was free to run into the space behind Diakhaby. It was at this point that Lyon manager Bruno Génésio finally adapted their strategy to protect his Centre Backs by dropping his midfield line to keep them compact. On the night, Peter Bosz’ tactics proved too much for Génésio’s men. Ajax simply outclassed their opponents in every aspect. Lyon looked lethargic and somewhat complacent, as though they hadn’t prepared mentally for the fixture, and they paid the ultimate price. Mistake after mistake allowed Ajax to find their feet and gave them the confidence to try and bury the tie before the second leg in Lyon. Despite the three-goal advantage, they continued to attack, showing Lyon that they weren’t to be underestimated. On another night, it could have easily been six or seven. Lyon certainly have their work cut out for them in the second leg, though you can’t help but think that with Lacazette in the starting line-up, they’re a different beast altogether. Ajax’s story continues for another week, with the hopes of 50,000 fans on their backs. It’s been over twenty years since Ajax last won a major European competition, could the “Sons of Gods” be the ones to bring glory back to the capital?